Needless to say, I need to fix meals that are quick and easy after having 3-1/2 year old and 13-month old boys here all day. I found this recipe for Chipotle Chicken Salad while searching for recipes using rotisserie chicken (Sam's sells biggest rotisserie chickens I've found). With a couple of minor 'tweaks', it turned out to be not only easy but really tasty! I had the chicken cut, the beans rinsed and drained, the onions chopped and dressing made the night before. Serve it up with a topping of Mexican blend cheese. There are not only crushed tortilla chips mixed into the salad but I served the salad with extra chips to garnish with a bite of salad on top. Have any of you tried the new Xochitl tortilla chips yet?. They are thin, crispy and a wonderful treat! Happy May and Happy Cinco de Mayo! Remove chicken breast from bone and cut into large chunks and reserve. Purée cilantro, chipotles, sour cream, lime juice, salt, and pepper in a small chopper/blender, then slowly whisk in olive oil. Adjust to taste with either more adobo sauce, sour cream or lime juice. 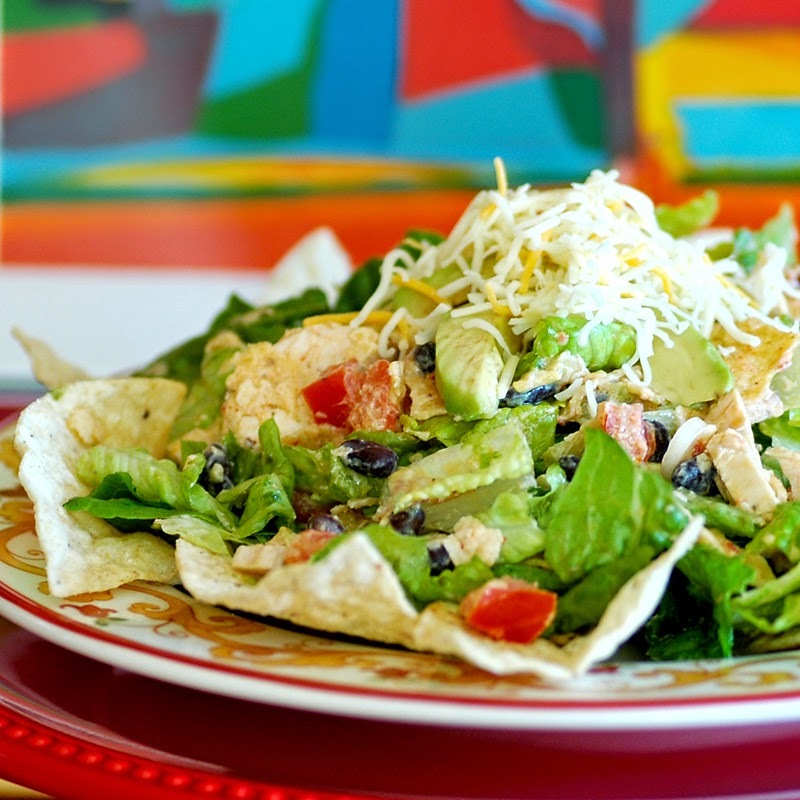 Place romaine, chicken pieces, chopped onion, black beans, cubed avocado, tomato and crushed tortilla chips into a large salad bowl. Add enough dressing to coat and toss gently. 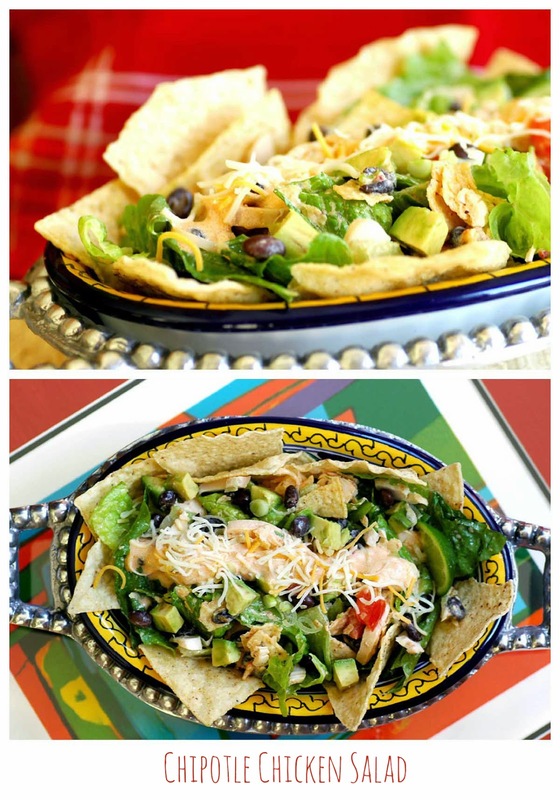 Serve with additional tortilla chips for garnish and to scoop the salad. Note: The original recipe does not call for sour cream but I find it's a nice, cool counterpart to the chipotles in adobo. The salad can also be served on whole romaine leaves rather than mixed with chopped romaine. PS: Did you know that you chipotle peppers in adobo can be frozen? I put one pepper and a little adobo sauce on a piece of plastic wrap and twist the ends together. Do this with all of the peppers left in the can and then place them in a zipper freezer bag. They are so handsome and getting so big :) They are adorable! Your chicken salad is right up my alley. I will definitely be making this soon! I love finding ways to take advantage of rotisserie chickens... and chipotle ranks high on my list. Can't wait to give this one a try. PS - the boys are adorable!! They are so cute!! I can get a lot of mileage out of a rotisserie chicken. Not sure about the heat in the chipotles, but the rest sounds yummy. I have not tried the chips yet - will look for them at the grocery. Oh, as the weather is (finally) warming, salads become especially enjoyable and this one sounds delightful! A lot of the flavors in this salad are a little new to our palate as Mexican cuisine is one we are least familiar with. Our kids are way ahead of us and are great introducing us to great new tastes. That sounds wonderful for a warm spring evening meal. Typo! It's a shock to me too ;). Fun times! 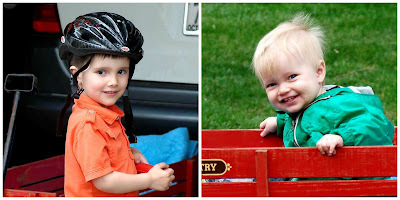 Precious grandsons--I can't wait for a few!! We get the rotisserie chicken from Costco which is quite good. I think this might be a good dish for Cinco de Maya! Your grandsons are far more sophisticated than mine! Mine still prefer Mac and Cheese or chicken nuggets. But the salad topped off the charming grandsons in a beautiful fashion! we have a few fave chicken salads..I will add this one..
Busier and cuter :). Thank you, Monique! Mmmmm..this sounds perfect for those evenings when we need something quick and easy. I know what you mean about needing to find those types of meals! I have been spending time at my daughter's...my nine month old granddaughter has us hopping! The salad is indeed quick to fix and so delicious too. Oh my but that looks good! When I work on the mainland I have a Chipotle Chicken Salad for lunch at least once in the week. I've never asked the restaurant for a recipe, but now I have yours - thanks! Your wee grandsons are adorable. What a treat for you and memories being made for them. Your grandsons are so adorable I can imagine how you look forward to Mondays and then collapse Monday evening. Great to think ahead to prepare what you can the night before. Your salad sounds yummy. How nice to always have Monday to look forward to. Your grandchildren are adorable! I can imagine how you must be looking forward to each Monday! A lovely plate of salad, looks very, very, good! We do look forward to Mondays. Thank you, Joyce! How nice that you have a special day to spend with your grandchildren. I'm sure you must look forward to Mondays. I'm always on the look-out for new ways to serve left-over chicken. Your salad looks delicious and I love the idea of the crunch from the chips. Thanks, Sam. We do look forward to our time with them. This looks very nice Susan - I seem to like everything with the word chipotle in it. Aren't rosisserie chickens a wonderful thing. And this salad looks so good. I have a similar version I've made with shrimp. But it's on a tostada. This would be MUCH easier to eat. This is such a delightful salad Susan and I can totally understand you trying to prepare something quick and tasty. Kids are so full of energy and they do require full attention as they tends to be very unpredictable sometimes. But I think being around them fills you with so much joy and fun that is worth all the trouble. Happy 1st of May! Oh - to be a grandma! Still waiting! All of the flavours in this dish are favourites of mine - as long as the chipotle is not too much - love the smoke, not the heat. Love the gorgeous salad recipe, looks delish! It's so great that you have built-in time to spend with them! This salad looks so tasty...definitely big on flavor! The boys are adorable and such good little salad eaters! What cuties they are! I imagine that's a full Monday and an easy dinner is in order. Your grandsons are adorable! I frequently babysit my two grandsons and I take care of my grand daughter every day now as my daughter went back to work full time, so quick and easy meals are also on my agenda, Susan. This looks delicious! Mexican food is so popular here in Colorado and I'm learning more about it as I am a real novice in making this cuisine. Anytime I see the word chipotle my heart skips a beat... I just love the flavor. Lovely quick chicken salad.... using rotisserie chicken is such a time saver and many are really delicious ( I'm very fond of the Peruvian style of rotisserie chicken myself). Will make this soon. Good for your daughter. I'm sure she'll have a good time and learn a lot in her MBA program. My hubby is 1/2 way done with his. Can't wait for his graduation day to come! 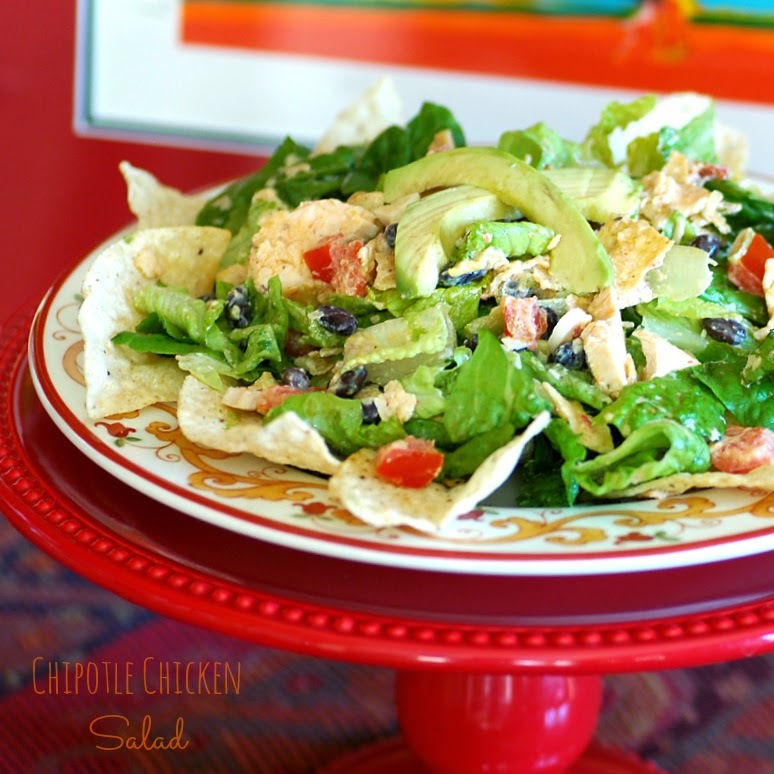 I love your quick, easy and healthful Chipotle Chicken Salad! I agree, after taking care of two young kids, all you want is a simple meal. ;) I can always use a simple recipe like this. Wish you a wonderful weekend. You are so fortunate to have grandkids close by. I don't see mine nearly as much as I'd like. Yours are dolls. Kudos to your daughter, too! Anyway....nice dinner salad chock full of great flavors. Have not seen the Xochitl tortilla chips yet, will watch for them. The boys are so adorable! You are very kind to do that every week. I would be exhausted watching mine, I don't think I could watch all 5 of them all day. A few hours and I am beat! This chicken salad sounds delicious and I often need quick dinners on evenings when I have any of my grands. My daughter will soon bless us with our 7th grand and this will be her second child. Tomorrow evening I will babysit my sons three girls while they go to a Derby Party. I never tire of seeing them but they can surely wear you out but in a good way. My oldest son has twin boys and we are now back on baseball fields enjoying them in Little League. Grands are just the BEST!!!!! I look forward to trying this recipe. Perfect for Cinco de Mayo!!! beautifully plated and photograph too! Just look at those two cuties...you are one lucky mamie! And your salad is beautiful..I love salads, all salads..and when they are quick to put together, especially now when fiddling in the garden a lot...all the better. What a delicious sounding chicken salad...as you say, perfect after a busy day. I love these kids are adorable and your chicken Susan look amazing!! What a fun reason to cook too, when you are having company! This looks so fresh and light preparing for the nice weather (which we are still waiting for!) But we do start to crave salads this time of year and I just love anything with a kick. How wonderful that she is getting her MBA and that you can help out!